Interviewer: What is your real aim in filmmaking? What are you trying to do with it? Ingmar Bergman: Just to come in contact with other human beings. It's a desire in me to touch other human beings, to touch the emotions of other people. There was a point in time when Ingmar Bergman was the best known, most written-about film director in the world. Born in Uppsala, Sweden in 1918, he first worked in the theater, then began scriptwriting and directing in the 1940s. In the late '50s, film criticism as an industry was still in its infancy, and serious critics found such films as The Seventh Seal and Wild Strawberries, with their themes such as man's relationship with God and death, and his alienation, irresistible. Through the next two decades, his films were endlessly dissected and appreciated, and the 1972 Sight and Sound Top 10 Critics' Poll includes two of his films, the only director to be so honored. While his critical star has fallen since then, his work continues to intrigue and entertain, and MGM's box set is a welcome opportunity to examine five of Bergman's films. Any attempt to break up Bergman's career would be an oversimplification, but in broad strokes, the 1950s were the time of his apprenticeship and exploration of religious themes and his concept of a distant and uncaring God. In the '60s, Bergman aggressively explored modernism and the impossibility of existence in the modern world, later to concentrate on the female psyche in the '70s. Four of the films in this set, Persona, Hour of the Wolf, Shame, and The Passion of Anna were filmed in the second half of the '60s, a time of great personal turbulence in Bergman's life, and they are among his darkest, most pessimistic works. Working mainly with a small group of actors (Liv Ullmann, Bibi Anderson, Max von Sydow, and others), and his longtime cinematographer Sven Nykvist, Bergman paints portraits of souls in torment, torn apart by their relationships and the circumstances and events that surround them. The remaining film in the set, 1977's The Serpent's Egg, is his sole English-language film, a study of 1920s Berlin. Taken as a whole, the discs in the set share much in common. The transfers are all good, with occasional grain. The supplements are generally informative and interesting, but MGM draws on a limited set of source materials; namely, new interviews with the actors, and a 1970 Canadian Broadcasting Corporation interview with Bergman. Brief snippets of the interviews are included in new documentaries on each of the discs, but these excerpts don't overlap with additional segments of the interviews, featured as standalone supplements. However, sections of the CBC interview (included in its entirety on this supplemental disc) are used extensively in the documentaries. Bergman's comments are general, and the repeated attempts to link these at best marginally-related materials to information specific to each film quickly becomes tedious, if not annoying. Original U.S. theatrical release trailers are included for each of the films, and all have commentary tracks, by actor David Carradine for The Serpent's Egg and by film professor Marc Gervais for the other discs. Gervais' commentaries are well informed and interesting, and include analyses of the films and their place in the context of Bergman's life and work. Each of the films also includes a gallery of production photos, which are repeated on this disc. Image Transfer Review: The new interviews and documentaries look wonderful, with deep blacks and vibrant color. The source materials for 1970 Bergman interview are in rough shape, but the transfer is as good as it can be. The photographs and text materials are excellently reproduced and a pleasure to read and view. Audio Transfer Review: As with the image, the sound for the new materials is excellent, with a good dynamic range and lots of clarity. Surround and subwoofer activity aren't really a concern with a disc such as this, and they're not missed. This new (2002) interview with Bergman, filmed in conjunction with the G�teborg Film Festival, is widescreen and has non-removable English subtitles. The 83-year-old Bergman amusingly begins by turning the tables on his interviewer, forcing him to switch chairs, and quizzing him about his early interest in film. But soon Bergman begins to speak about his ongoing love of cinema, the fact that he watches five films a week, and expresses his disappointment that most current directors are talented but have little to say. He talks briefly about his lifelong relationship with the plays of Strindberg, then at greater length about his current projects. This 39:16s minute interview definitely concentrates on the present, rather than the past, as is entirely appropriate for an artist who is by no means a spent force. Taken from the Canadian Broadcasting Corporation's Man Alive program, this 21-minute interview with Bergman (in English) is in poor shape, with unnatural colors and many source flaws. In it, Bergman discusses his fascination with his first film projector, his goals as a filmmaker, the role of the artist in society, and his eventual rejection of an external, objective God. In terms of understanding Bergman's world view and how it's reflected in his films, this is the meatiest, most useful item on the disc. In its 14m:32s length, Marc Gervais discusses the island where Bergman shot most of the films in this set and calls his home. There are biographical details, including his relationship with Liv Ullmann, clips from several of his films, and a concluding section that features still photographs by Aldo Garzia, duplicated elsewhere on this disc. Swedes and pedants will notice that in the menu, the small "o" above the "a" in "F�r�" has mysteriously moved and now sits atop the "F."
Nykvist was Bergman's cinematographer and camera operator for most of the second half of his career, and his contribution to Bergman's work cannot be underestimated. Marc Gervais once again narrates, while Bibi Andersson, Liv Ullmann, and Erland Josephson provide brief comments on Nykvist's work. The most interesting part of this documentary is an analysis of the table scene from Hour of the Wolf. This section of the disc consists of articles from a 1972 issue of American Cinematographer magazine with the theme "Film-Making in Sweden." There's a lot of information here, starting with the history of Swedish film, the then-current state of the industry, and the major industrial players involved. Further articles by Bergman and Nykvist explore their artistic inspirations, philosophy, and working methods. While some of the articles are fairly technical (details of super 16mm film, for example), this section as whole provides valuable background information on both artists. Kudos to MGM for the best reproduction of magazine articles on DVD that I've seen�the text is clear and easy to read, and the photos are presented first with their accompanying captions, then again in closeup, so no detail is lost. Over 175 production photos (and a few posters) from the five films in this set are displayed in the section The Films of Ingmar Bergman, organized by film, and repeated on each of the individual discs. Once again MGM has done a good job of translating print material to DVD, as the photos are clear and fill up most of the screen, unlike many DVDs where much of the available real estate is wasted. F�r� Island consists of 55 photographs of the austere and desolate beauty of Bergman's home, taken from Aldo Garzia's book F�r� Island Photographs 1998. They don't add much to one's appreciation of Bergman's films, but they are pretty to look at. The nine posters in Poster Gallery are almost all repeats from The Films of Ingmar Bergman. 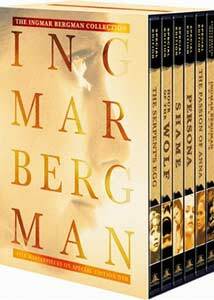 MGM's The Ingmar Bergman Collection: Supplemental Materials contains a good selection of documentaries both old and new, production photos and related materials, and magazine articles. There's a minimum of fluff here, and Bergman fans will find them to be useful and insightful.